Too hot to light a campfire at your summer party? 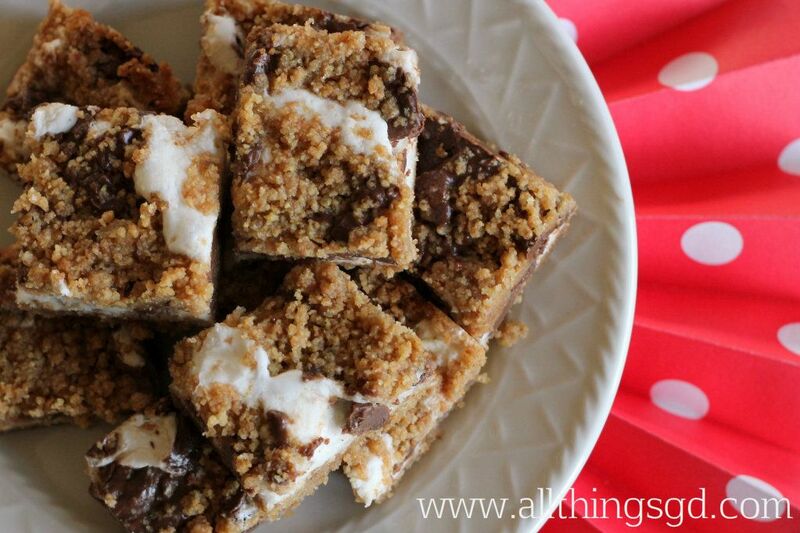 Then these s’mores bars are for you! Make them up ahead of time and keep the lighter fluid, gooey skewers, and fear of burning down the house at bay! Toss graham crackers into a food processor (or use the good old plastic bag and mallet trick) to turn your crackers into 3 cups of crumbs. Stir in melted butter and sugar. Press half of this mixture into the bottom of a 13x9x2″ pan to form your crust. Sprinkle with marshmallows and chopped chocolate. Top with the remainder of your crumb mixture and press down firmly. Bake at 375 degrees F for 10 minutes. Remove from oven and carefully press the top down with a spatula. Cool completely (I cooled and then refrigerated mine) and then cut into small squares. 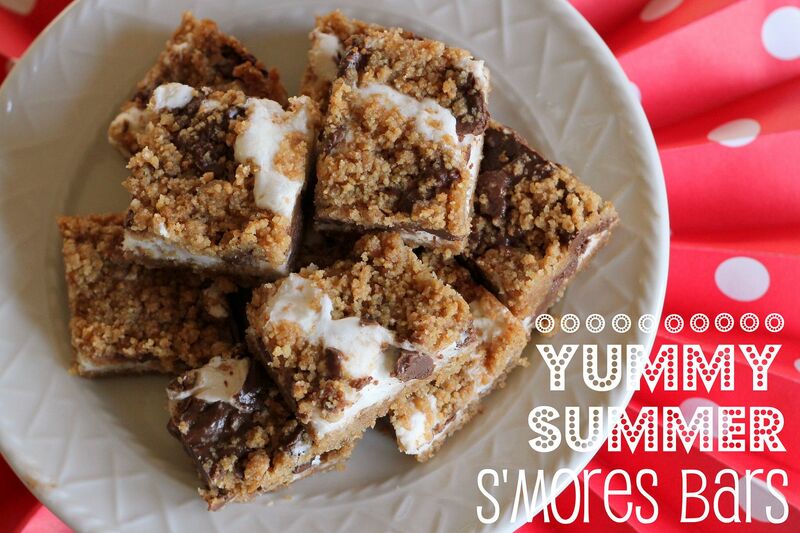 I made my s’mores bars using chopped up homemade marshmallows I made for this year’s Fourth of July party and I think they made the bars even better! You can find the recipe I used for my homemade marshmallows at one of my favorite food blogs: Our Family Eats. Give them a try – they’re even easier to make than you may think! After reading reviews for this recipe it sounded like you may want to increase the crumb mixture by half (or even double) if you use the pre-made graham cracker crumbs out of the box. Let me know if you make these – I’ll be coming to your house! Thanks for posting! Just pinned this. But be honest, did you post this because I threatened to come to your party next year and gobble up all of your s’mores bars? Now I can make my own, so no worries! I’ll definitely be making these! Just made a batch to bring to a party tonight. The kids and I are going to a friends house to watch the fireworks over the ocean. This sounded like a perfect treat for kids and kids at heart. My Hubby is going to be so sad when he finds out he is missing out on this yummy dessert! Oh, yum! Good idea since we’ve been under the burn ban around here lately! Ooh Sarah – then you are going to LOVE these! LOL Erin! You’re welcome at my house any time – we’ll make a double batch! @Courtney: I hope they were a hit! @Kate: Excellent point. These are perfect for when you’re under a burn ban! These look SO good! I’m going to have to try these! You should, Carla! Let me know what you think when you do! These look do good!! I read the ADHD story on the ‘Our Family Eats’. How scary and eye opening, makes me want to clean out my entire pantry. Hope you had a great weekend D! @Karen: I totally agree! I’ve really tuned in to Kate’s behavior when she eats something processed since reading that article. Store bought marshmallows turned her into Crazy Girl which is why I also decided to try making my own. It’s amazing how much food affects our children – and us! Thank you Nat and Faye!